St.Vincent, Your Affordable Caribbean Beach Paradise. Welcome to Harmony Hall Resorts, St. Vincent. Your Comfortable Luxury Affordable Vacation Rentals. 1 & 2 bedroom fully equipped apartments on private manicured grounds. Close to beaches, shopping, restaurants and nightlife. Private manicured gardens and grounds with amazing views of the southern Caribbean Sea and neighboring Grenadine Islands. 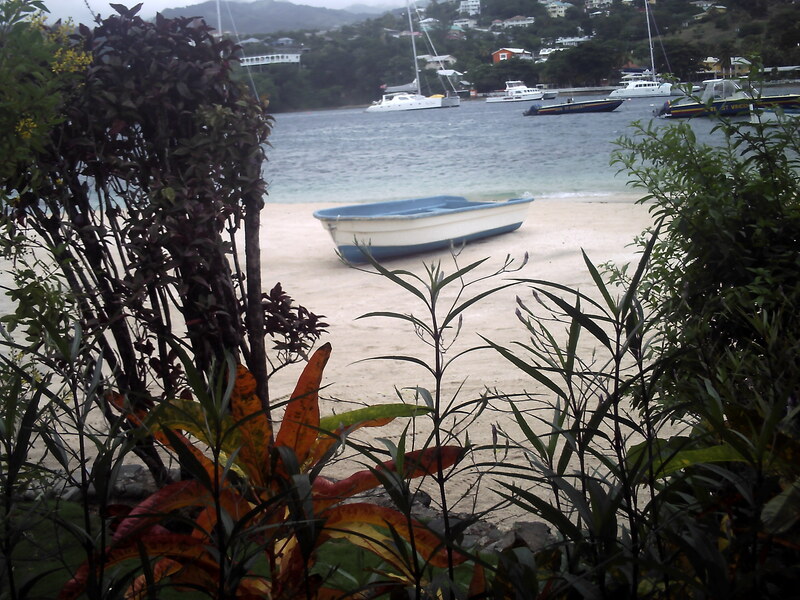 Bequia and the Grenadine islands are a perfect day trip away. 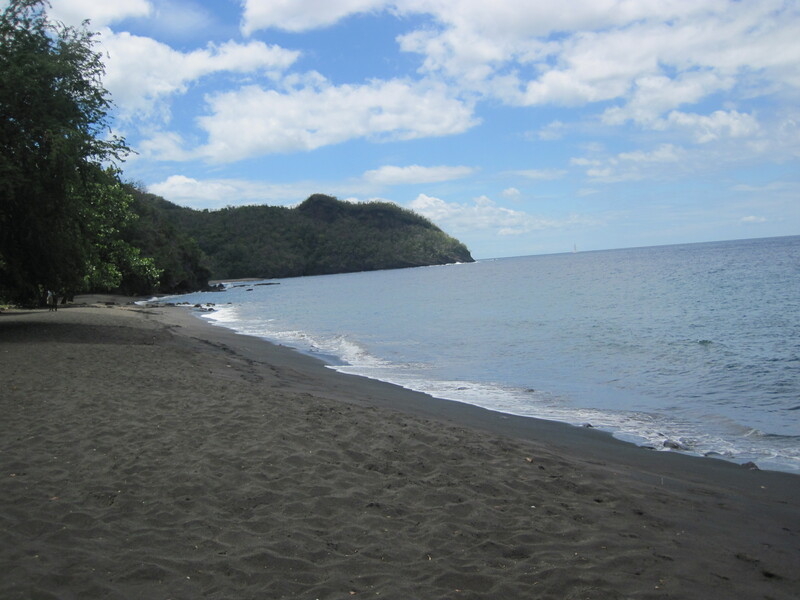 Just minutes away from white, gold, and exotic powder soft black sand beaches. When should we reserve your time here in paradise? BOOK NOW!! Chill & Relax for a minute on this beach for “A moment of peace”. Relax, your on island time. 1 Bedroom Apartment Suite with Private Lanai & Ocean Views = $99 USD/NT. 2 Bedroom Comfortable Luxury Apartment with garden patio and Ocean Views = $149 USD /NT. prices are exclusive of VAT and accommodation tax. You should be relaxing here. Any time of year is good. Private entrance and covered patio. Fine wine and palm trees – Ahhhh!! Harmony Hall Resorts, private entrances and tropical gardens. Carefully decorated in hand chosen local art. One of the lowest crime rates in the Caribbean and water safe from the tap. Let us customize your vacation just for you. Scuba Dive , Honeymoon & NOW- Musicians Packages Available. Harmony Hall Resorts proudly offers our newly renovated & updated 1 & 2 bedroom comfortable luxury apartment rental suites on private manicured grounds. Come relax alongside our private tropical garden and pond. Take a nap in a hammock under swaying palm trees while enjoying the amazing Caribbean Ocean views. Relax with a cocktail on your private lanai or patio while enjoying the best Caribbean sunsets you have ever imagined. visit our diving & snorkeling page for some incredible dive package deals! 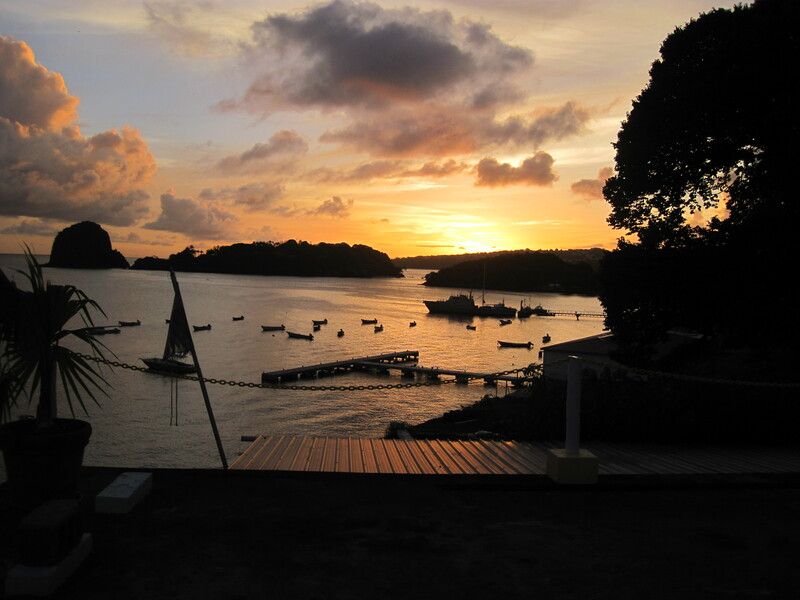 Another Amazing Caribbean sunset over Blue Lagoon, St.Vincent. Exotic, Romantic Tropical Honeymoon Packages Available! World class snorkeling and diving all around St.Vincent. The warm, clear, calm Caribbean bays are shallow and welcoming. The reefs are rich and teaming with colorful fish and corals. The windward side of St. Vincent offers consistent breaks for surfers and boogie boarders. The exchange rate is fixed to the US dollar at $2.67 = $1.00 in your favor so you can spend more time here in St.Vincent. Making all of these, reasons to travel here to St. Vincent. Come find these reasons and many more. Between the botanical gardens, the rain-forests and waterfalls, the pristine empty beaches, the world-class snorkeling and diving, and the easy day trip, hopping from island to island via ferry, you could easily get lost in our lap of paradise for months on end. It’s time for your boat to come in. Shallow easy to reach reefs await. If Caribbean island travel is on your list, Harmony Hall Resorts, St. Vincent is your secret private retreat in paradise. Quiet romantic beaches and calm Caribbean seas are waiting for you. You have friends in paradise at Harmony Hall Resorts. Travel well and we will see you soon. COMING IN DEC. 2018- NON-STOP from MIA every Sat. on American Airlines! You should put yourself in this picture of peace, luxury and tranquility. 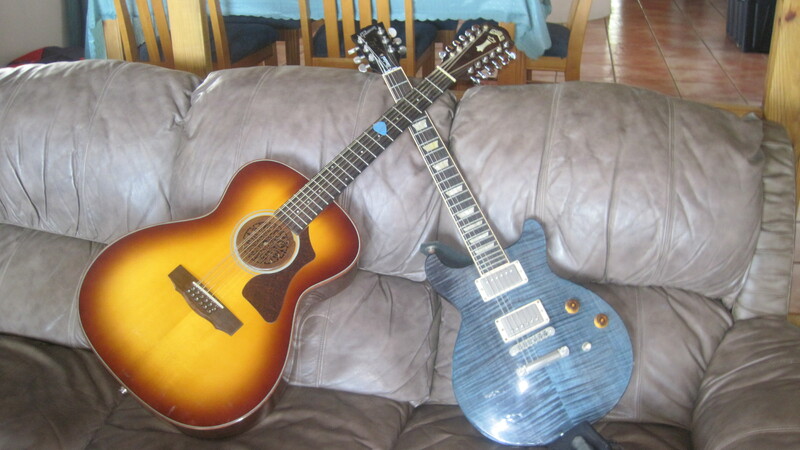 Musicians – Have you ever wished you had your guitar with you on vacation? Even better, ever wish you could remember those awe inspiring tunes and lyrics you wrote while sitting in that incredibly beautiful and inspiring tropical setting? Well now you can. Without the cost, hassle or worry of transporting your own guitar or gear. Come stay with us at Harmony Hall Resorts,St.Vincent and we’ll supply a guitar for you to enjoy on our tropical island and we have a small digital studio where you can record your inspirations directly to CD. Special Musicians packages available. Harmony Hall Resorts, St.Vincent is your island home in the Caribbean. Time and money come and go but memories last forever. Come make your tropical island memories some of your best. Let Harmony Hall Resorts, St.Vincent show you how. Starting at Only $99 nt. E-Mail us at futonsfutonsfutons@gmail.com for more information, reservations or special requests. Call us directly at 784-492-2294 or skype number at 970-366-4113 ( Leave a message as to when exactly you will call and we will be there to answer.) Skype is call in only, but based in the US for reduced international fees. Hard to get to, but well worth it once here! The longer you stay the more affordable it becomes! NO CROWDS. A true Hidden Gem! Visit us on facebook at “Harmony Hall Resorts.Stvincent”. ASK ABOUT OUR AMAZING SPECIALS!! HONEYMOON SPECIALS AVAILABLE UPON REQUEST!!! ASK HOW WE CAN HELP ARRANGE AN ALL – INCLUSIVE PACKAGE CUSTOM DESIGNED JUST FOR YOU! CHECK OUT MY NEW BOOK TODAY !! Please feel free to blog us at the bottom of the page but please leave your e-mail so we can answer your questions and requests directly or shoot us an e-mail via the link at the bottom of the pictures above. We enjoy and look forward to your comments and hope to see you here at Harmony Hall Resorts in St.Vincent soon. Named By Caribbean Journal as one of the Top 10 B&B’s in the entire Caribbean! Book Your Spot TODAY! Note all pictures are property of Harmony Hall Enterprizes LLC. Unauthorized use outside this web page is prohibited. St.Vincent, St Vincent, Saint Vincent, St. vincent, Saint Vincent & the Grenadines, Saint Vencent & the Grenadines, St. Vincent Island, Saint Vincent Island, Grenadine Islands, Caribbean resorts, Caribbean islands, Beaches, Apartment rentals, vacation rentals, vacation resorts, holiday lets. Looks incredible! Can’t wait for some fun in the sun and leave this cold weather behind. As I promised, I am leaving you a message! I like the site, feel free to visit us in Union any time! Cathi & AJ: Mary Kay, Helen, and I had a fabulous time on St. Vincent. Thanks for all of the wonderful snorkeling excursions. I can’t wait to come back! Great new website.Michele, Josh and I cannot wait to come and enjoy this wonderful place with you. We miss you guys and hope to see you soon!!! Thanks for the snorkeling experience on our cruise vist to Villa Bay last week. It was nice meeting you on the beach, it was the best snorkeling I have ever done. Like the Web site, if we ever think of holidaying in St Vincent, will give you a call. Beautiful Pictures!!! Really want to come down and enjoy warmth from the sun and good friends. Made my reservations for July! It looks s awesome! Can’t wait to get there for some fun and relaxation! we hope to get out and see it soon ! I love your website and view it often and do plan a trip there at least by Nov next year! Look forward to seeing you and your wonderful island you now call home! Looks absolutely amazing! Cant wait to see it in person. Hey AJ and Cathi. Really miss you guys. I had the best time staying with you and I am coming back again. Hope your ready cause I’ll see you again in April!! For all you guys thinking about going it really is a great place. Great weather, beautiful, and super friendly locals…i mean crazy super nice people and no hussle. I hate the hussle and I can honestly say I was only asked for money 1 time and it was for a church function and it was very low key and no big deal. AJ said he’d never had that happen before and i believe him. I had lots of locals come up just to say hi and ask if i was enjoying the island. It’s a super low key, undeveloped, non touristy little paradise down there. Oh, and did I mention the excellent snorkeling right off the beach? Warm clear water and lots to look at and no crowds. Could it be any better? Highly recommended! I’ll be back! AJ and Cathi – – looking at the photos brought me right back to the beach! What a fine time we had with you! I have been telling everyone I meet what an unspoiled place St. Vincent is, and what lovely hosts you are. Good Luck!! The oldest of the three sisters!!! Walt and I are looking forward to seeing you March 8th thru 22nd. for some much needed fun in the sun! It looks wonderful! I can taste the fish and the rum. Peace! It looks so warm and inviting, especially when we have been in the single digits these last few nights! I definitely can’t wait to book a trip sometime soon! 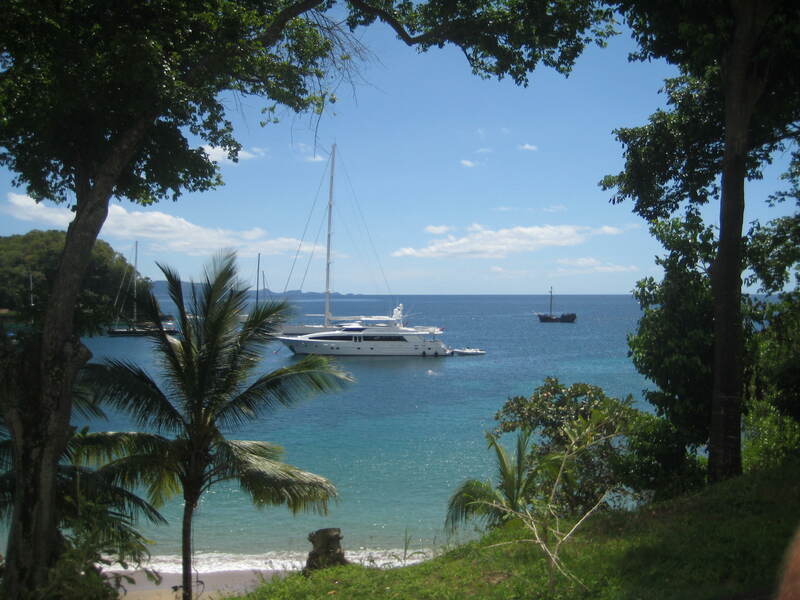 I just returned home in the States from my wonderful St. Vincent and the Grenadine Islands holiday at your property. It was truly above and beyond my expectations. From the lovely apartment accomidations in your beautiful home to the amazing views the island has to offer. I thouroughly enjoyed the incredible landscape of the island. The hiking of the rainforest, beaches, palm trees and volcano all where above and beyond my expectations. The views and sunsets where breath taking! The mountainess lushness of the landscapes is really incredible and amazing. Your snorkeling equipment was first rate. The ease of snorkeling and experiencing the coral reef was like a world of it’s own. Never have I seen anything like that! Also, kayaking around Love Island and The Rock was exhilirating to say the least. What an awesome view and experience! One of the biggest and appreciative surprises was your 5 – Star catering services. All the cusine and exotic food was incredibly prepared and most importantly tasted great. It couldn’t have been better! Thank you for spoiling us with your cooking. I definitely will be back! I highly and gladly recommend your property and services to anyone as well as my friends and family. Your knowledge and attention as well as helpfullness made this vacation my best one ever!!! Thanks again! Thank both you AJ. & Cathi for a perfect carribean get away. Hello There. I found your weblog the usage of msn. This is a really smartly written article. I’ll make sure to bookmark it and come back to learn extra of your helpful info. Thank you for the post. I will definitely comeback. Cathi and A.J., Thank you so much for the great time we had. Although it was a short visit for us, your place is beautiful! The “Gang” hope to return soon. In addition, THANK YOU for taking us to the restaurants you did. The food and atmosphere were awesome! AJ and Cathi, we came back from our stay with you guys and we cant wait to go back. You two showed us the greatest hospitality that we now consider you our family. Your place is so beautiful and peaceful, it makes staying there hard to separate from! We definitely recommend Harmony Hall to anyone needing a peaceful, cozy and enjoyable stay in St. Vincent!!! Thanks again for everything and hope to see you in the future. I look forward to getting a tour guide and hotelier all in one! Next beach trip will be to see you guys. I had the most awesome time in St. Vincent and at Harmony Hall! St. Vincent is a beautiful island, so lush and green. The beaches are great and the clear blue water is amazing. You can totally see your feet when you look down, it is that clear! The people are sooooo friendly too! I have been to several locations for snorkeling and scuba diving, but this was one of the best, especially because you can snorkel right off the beach! I really enjoyed going to the waterfalls and doing some Kayaking. I can’t say enough about how wonderful it was there in St. Vincent. Can’t wait until I can go back again! We met AJ & Cathi on the beach at St. Vincent and had such a great time chatting that we got sunburned because we stayed out there talking so long! And while we were already committed for our lodging those few days, we enjoyed their company sooo much that we hired AJ to take us on a tour to the falls a couple days later. AJ is such a wealth of information about the island AND many other things!! We had an absolute ball touring the island, swimming in the falls and lunching at the site of the Pirates of the Carribean set. AJ even took pics for us and sent them along. It was a memorable day at an extremely reasonable rate and it was great because we could understand what he was saying when he told us things about the island! When we return, we definitely will spend some time at Harmony House and look forward to AJ’s cooking and Cathi’s company! AJ & Cathi, can’t thank you enough for the hospitality you extended to my brother & I during our recent stay at Harmony Hall Resorts during the first week of April earlier this year. You guys were awesome and made us feel right at home. Your accomodations were very clean, comfortable and well equipped. It’s unfortunate we did not catching any fish when we went fishing but I did catch a buzz and get attacked by a crab. Your knowledge of St. Vincent and the islands was amazing. At some point I will be returning and will drop by to say hi with some more gifts for neighbourhood kids. For anyone reading these comments who may be traveling to St. Vincent and requiring accomodation, you really need to experience the hospitality at Harmony Hall Resorts. AJ & Cathi thanks again for a memorable time and hopefully we will be back soon for another visit. Keep well my friend! Thanks for your wonderful hospitality we very much enjoyed our stay! Best wishes for the holidays. Hi Ari. Your accommodation is perfect. Villa is a very pleasure and comfortbale. Your service was excellent. Trip around the island and snorkeling with you and Cathi was wonderful. I was sad to pack my bags two weeks ago and leave Harmony Hall Resorts. I had the most wonderful Carib vacation with my stay there. First of all, the apartments are immaculatly clean, spacious and have wonderful views from the well maintained property. Secondly, AJ and Cathi provide a concierge service, beaten by none. Cathi and AJ took us to secluded beaches, snorkelling (teaching provided re: snorkelling and wildlife), waterfalls and the most amazing salt ponds, where you feel you are on a different planet. They also provided with a private tour guide to see the amazing botanical gardens. St. Vincent, is very pristine and not over run by tourists. The locals are inviting, friendly and helpful and it is a country where I really felt safe. AJ and Cathi are very laid back, friendly, trustworthy and accomodating. I will go back there, as often as I can, and I can’t wait as there is still so much to experience. These pictures are AMAZING and I would love to visit St. Vincent in the very near future. Thanks for sharing your post on Wanderlust Wednesdays, and I hope that you’ll continue to do so! Hi there it’s me, I am also visiting this site daily, this web page is in fact good and the viewers are actually sharing pleasant thoughts. I have been exploring for a bit for any high quality articles or blog posts in this sort of house . Exploring in Yahoo I ultimately stumbled upon this web site. Studying this info So i am satisfied to express that I have an incredibly good uncanny feeling I found out just what I needed. I most certainly will make certain to donˇ¦t forget this web site and provides it a glance on a constant basis. Really Sweet Site Ya Made Here.. Very Educational Subject For A Blog Keep Up The Amazing Work! Yes! Finally something about travel. Rose and I are coming back! See you Jan 2014. This is the right blog for anyone who desires to search out out about this topic. You notice a lot its virtually arduous to argue with you (not that I actually would want…HaHa). You undoubtedly put a new spin on a topic thats been written about for years. Nice stuff, simply nice! My friend and I stayed at Harmony Hall for a week in April. We very much appreciated AJ’s and Cathi’s hospitality and helpfulness to organize our activities. We rented a car for four days and explored the island which was a lot more interesting than our second week on Barbados. We had a great time; should have stayed longer. Thanks AJ and Cathi. We spent part of our Christmas vacation on St. Vincent. We stayed at AJ and Cathi in a fantastic apartment in which it lacked for nothing. The apartment was well equipped and everything was beautifully arranged. AJ and Cathi helped us where they could. They drove us to the next town, the airport and picked us up when we had at that time no rental car. Even when renting the car helped AJ. AJ gave us even a local mobile phone and helped us with a compressor when the rental car had a flat tire. Also, they gave us valuable tips for snorkeling and how to reach other attractions on the island as well. All in all we had a great time, which we always like to remember. This was, without a doubt, our best family vacation. Harmony Hall is beautiful. We are a family of 5 and stayed in both the 1 and 2 bedroom apartments. They are both beautiful, comfortable, and spacious, and the one bedroom has a beautiful view from the kitchen/dining room and from the private balcony. AJ and Cathi were amazing and a large part of what made this our best vacation. They were always ready to give advice, take us on excursions, and tell us about the history and people of this beautiful island. 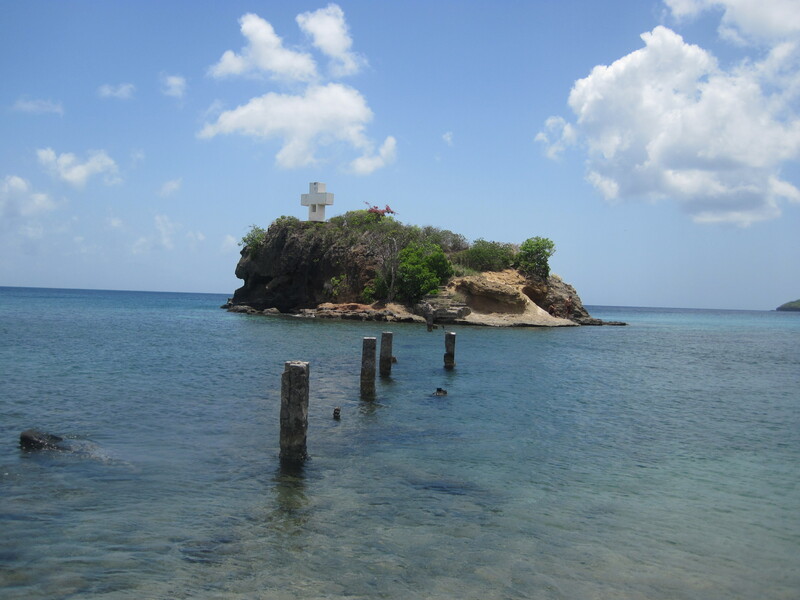 If you are looking for an authentic island experience, don’t miss St. Vincent’s. The people are friendly, the snorkling is amazing, the beaches are beautiful, the waterfalls are incredible; and Harmony Hall is the place to stay. Our 10 days was not enough, and we are hoping to come back soon to Harmony Hall to spend more time on St. Vincent’s with AJ and Cathi. We enjoyed our stay at Harmony Hall tremendously! I loved the fully-equipped two-bedroom apartment, and from the time AJ and Cathi picked us up at the airport until they dropped us off again 10 days later, they were the perfect hosts. We went for the diving, and left wishing we had time for so much more. We’re hoping to get back soon, plan on using the Rothbergs’ expertise to make it another great visit. And Cathi’s mango bread is the best!